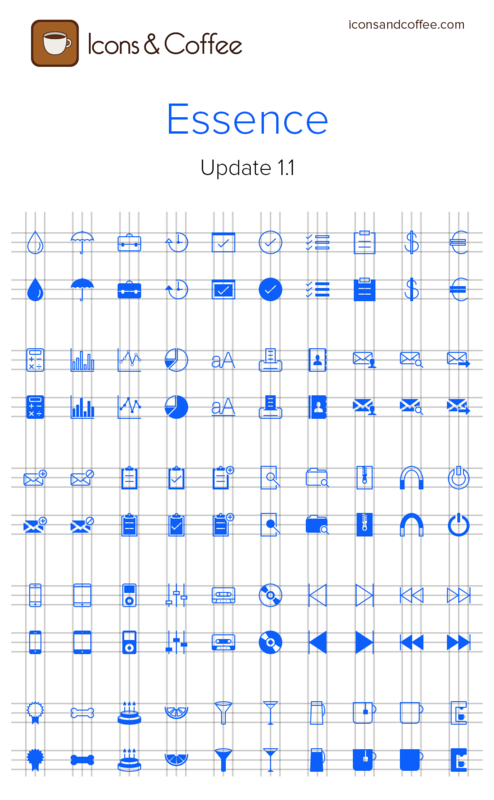 As we announced last month, today we’re releasing an update to our Essence icon set. Here’s a preview of the new icons in Essence’s 1.1 update. The update includes 50 of the most requested icons by our customers, and it expands upon Essence’s focus on productivity, media, and food-themed icons, among others. Customers who bought the initial set of 300+ icons will receive an email containing a link to download the updated set for free; new customers will automatically get the original set and the update by buying the icons starting today. As with the initial set, the icons come in two separate versions: outlined and filled, available as PNG files and vector formats. With this update, we’ve added blue PNGs (white and gray PNGs were already included in version 1.0) and a PSD file (in addition to AI and PDF files). We’re extremely thankful for the support you’ve shown so far. If you have feedback or questions, please send us an email or get in touch on Twitter.